To celebrate Mother’s Day a few weeks ago, I originally planned to treat my mom and both of my grandmothers to a delicious brunch/late lunch/early dinner. Nonna had just arrived two days prior to spend the summer and early fall with us, and I was supposed to pick up Gram from the airport after another one of her Italian adventures. Since we would all be together, I wanted to celebrate these wonderful women, and my beautiful mother, with something other than material gifts. Time is a far more precious gift than any box you can wrap up and stick a bow on. I learned fairly early on that it was important to treasure the people in your life for as long as they are there–because you never know just how soon they will be gone. Sometimes I get caught up in my own busy life and forget how crucial it is to remember them. How lucky I am to have so many inspiring, lovely, strong people in my life. Holidays are a great reminder to cherish those important people, though I don’t think they happen often enough. Every day should be a reason to celebrate the people we love. To thank them for their guidance, love, and friendship. To thank them for being in our life, for being part of the world. Rather than take them out to celebrate on what would surely be a very busy Mother’s Day, I decided to make a home-cooked meal instead so we could enjoy some down time. A day or two before, Mom and I had gone to the nursery a couple of blocks away from our house. There is a small grocery store on the property that has changed hands more times than I can count in the seventeen years we’ve lived in the neighborhood. The store has a new owner, once again, and they were selling some fresh fruits and vegetables outside of the store in anticipation of the store opening. We picked up string beans and mangos that afternoon that were so delicious, I had to go back for more! I had been wanting to make stuffed veggies for quite some time, but every recipe I knew of revolved around peppers or mushrooms–yuck! I scoured the web for a couple of hours and could still barely find a recipe I was really excited about or one that I wouldn’t have to substitute every other ingredient. So I made my own. Preheat oven to 350°F. Cut zucchinis (or cucumbers) in half lengthwise. Use a melon baller or spoon to scoop out seeds and flesh into a large mixing bowl. 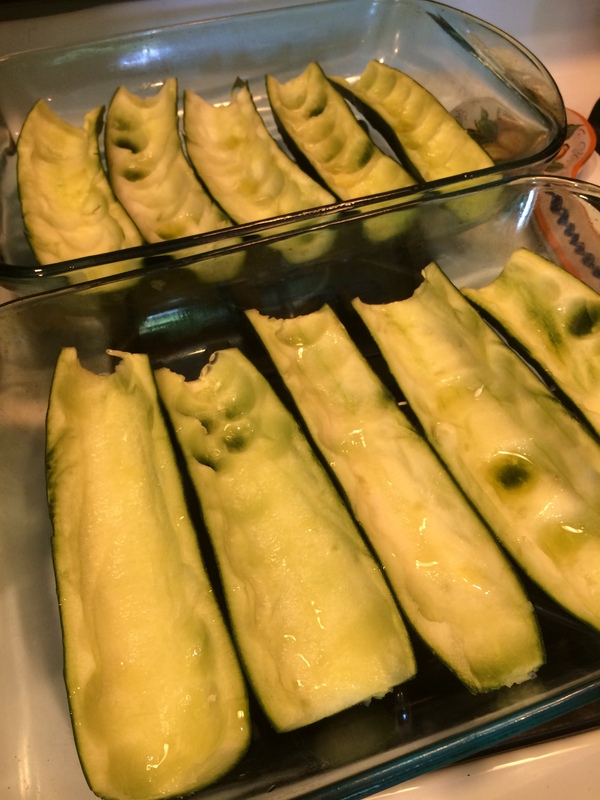 Put zucchini halves in glass baking pans and drizzle with olive oil. 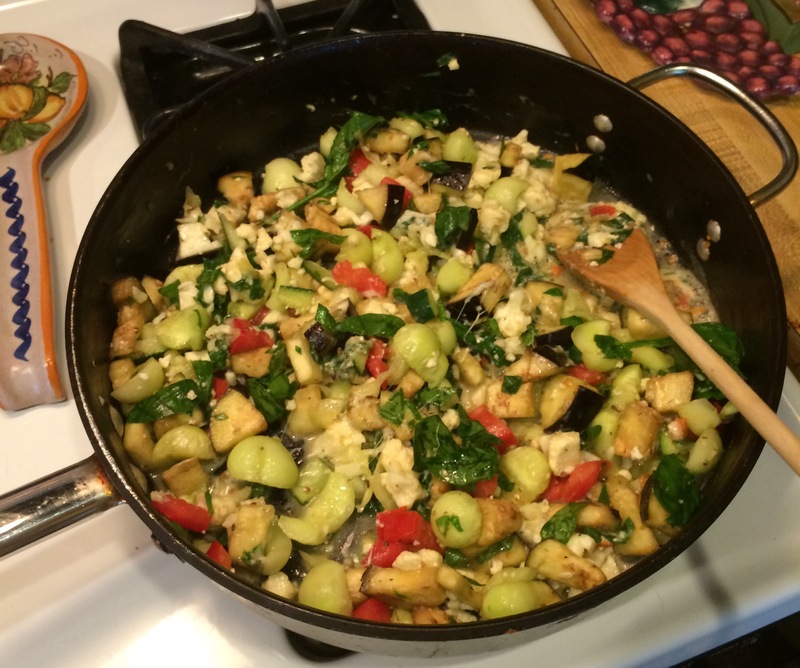 Chop tomatoes, eggplant, cauliflower, and spinach. 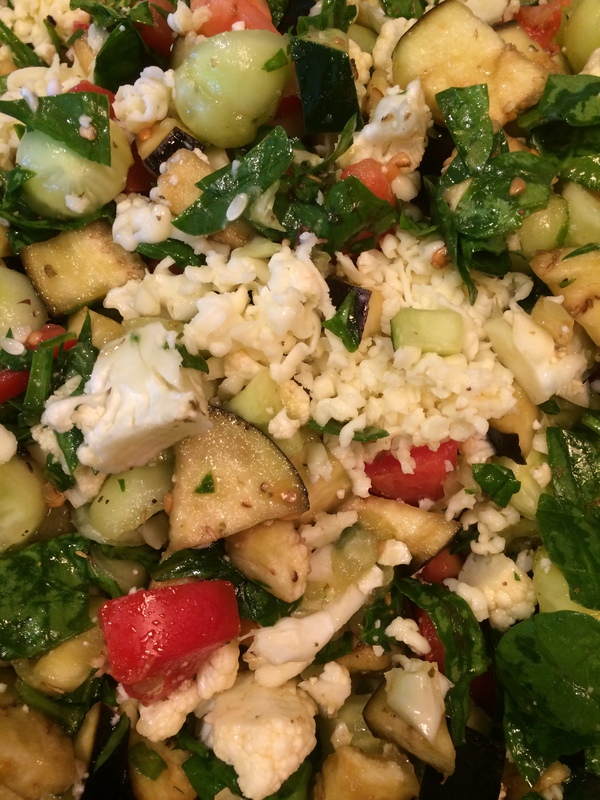 Add to mixing bowl with zucchini. Toss vegetables with olive oil, herbs de provence, salt, and pepper. Over medium heat, sauté vegetables for 5-10 minutes, then add mozzarella. 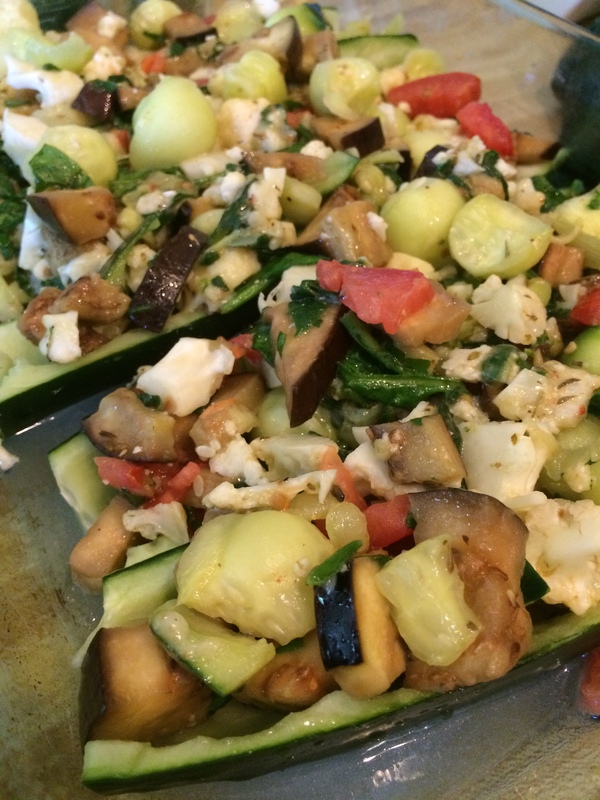 Fill zucchini halves with cheese and vegetable mix. Cover bottom of pans with water and cook for 30-40 minutes, or until boats are tender. Mix bread crumbs and parmesan together, top zucchini boats, and finish cooking until topping is melted and golden brown. Remove from oven, let cool for 5 minutes, and serve. I used Tuscan herb flavored olive oil that we special order from a local vendor, but extra virgin olive oil would work fine as well. I also listed that you can use zucchini or cucumber, but the same directions apply for both. On a note that is both incredibly embarrassing (for me) but still quite funny (for everyone else)… When I went to the market, I clearly thought I was picking zucchinis from a basket that was clearly labeled “zucchinis,” and the woman who rung out my order charged me for zucchinis. But when my mom went to make zucchini bread with the leftover vegetables, she realized they were cucumbers. I had spent hours in the kitchen cooking and then eating cucumbers and thought they were zucchinis the whole time. Cue face palm. The cucumber boats were delicious though, so I recommend trying them with cucumbers as I (accidentally) did and then with zucchinis, as I had originally intended, because they are just as delicious. It makes for the perfect warm-weather meal because it’s filling enough without being too heavy, and with all of the new vegetables we have growing in the backyard, this will surely be a summer staple. 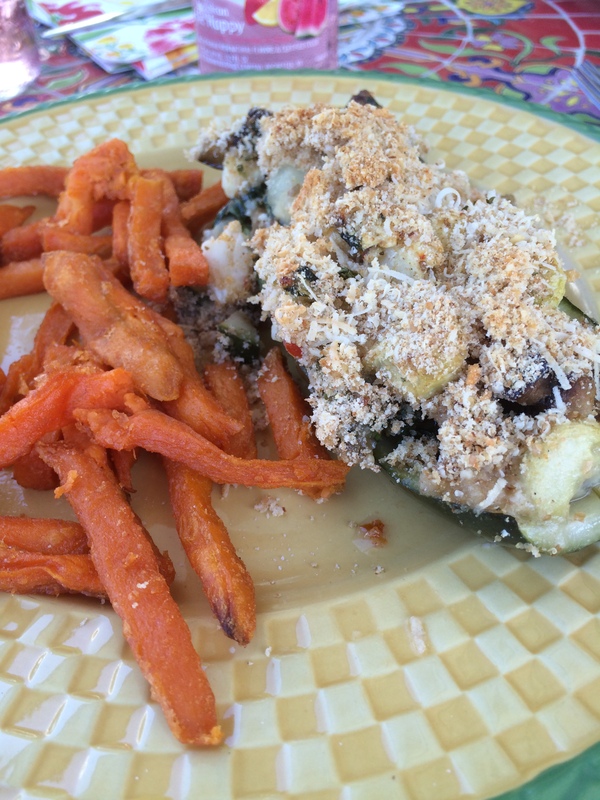 I served my stuffed veggie boats with Alexia Sweet Potato Fries with sea salt and it was absolutely perfect. They would also be great with a side of rice, pasta tossed in olive oil, or on their own. It was a humid and sticky day when I made these, nearly 90°F, which made cooking in a hot kitchen not so fun. But, wow, was it worth it! We enjoyed our meal out on the back deck, and then I cooled off with a quick dip in our very cold pool. For dessert, Mom threw together fresh strawberries, fresh whipped cream, and shortbread cookies straight from Italy. Talk about a good meal! You are fabulous! Reading your blog made my smile stretch around my head! Can’t wait for the next one!!! Love you to the moon and stars! Wow. I want this in my mouth. This looks delicious.